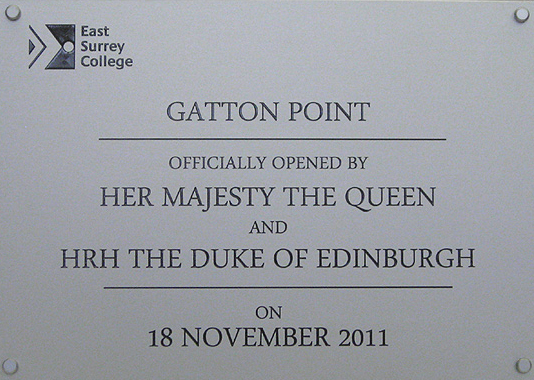 Her Majesty Queen Elizabeth unveils an Able Engraving plaque at the opening ceremony of a new campus at East Surrey College on the 18th November 2011. 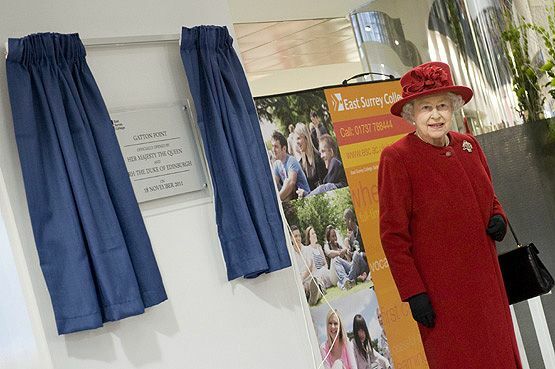 The Queen and the Duke of Edinburgh visited East Surrey College in Redhill to officially open its new campus. A crowd of enthusiastic well-wishers gathered at the college gates in London Road to catch a glimpse of the royal couple, who arrived in a maroon Bently on Friday afternoon. The Lord Lieutenant of Surrey, Sarah Goad, acting college principal Jayne Dickinson and chair of governors Barbara Spittle greeted the pair. While the Duke spent time joking with Crispin Blunt, Reigate MP, in the foyer, the Queen spoke with some of the students. After a two-hour lunch sitting, the group re-emerged for a tour of the state-of-the-art facilities. The much admired plaque is an A3 size engraved silver anodised aluminium plate with black infilled detail, mounted on an oversized 5mm thick clear acrylic backplate with polished edges and supplied complete with dull chrome stand off fixings. After unveiling the college’s new plaque, the Queen smiled as she was presented with a small bunch of flowers, arranged by the horticultural department. Students and staff flocked to the front windows to wave goodbye as the royal entourage made their way to the waiting car at about 3.30pm. This entry was posted in Able News on 19th September 2013 by admin.